Hi, friends! Can you believe April is over already? I know I'll be graduating in a little over two weeks, which is absolute insanity. How are you guys holding up? Congratulations to all of my fellow college beauty buffs on their upcoming graduation! Let's celebrate with some makeup, shall we? 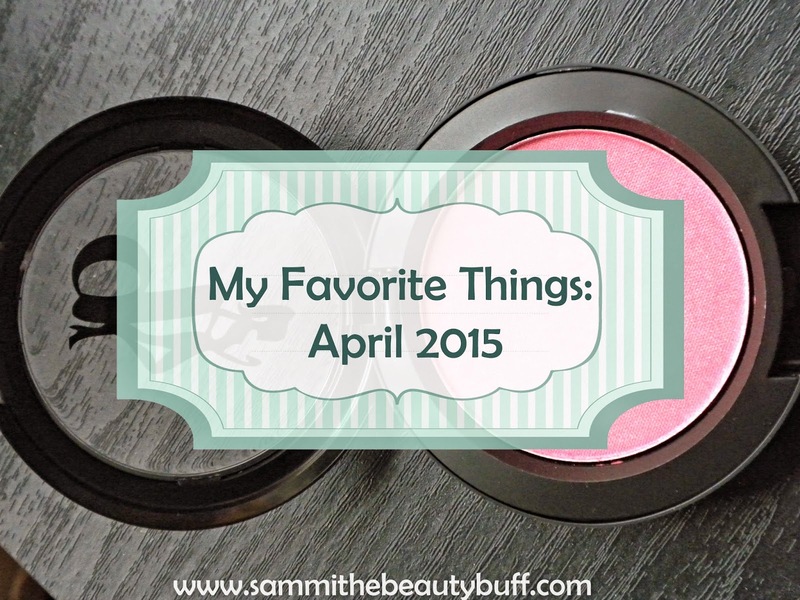 Today, I'm talking about my favorite things from April! I don't know what it is (or maybe I do: it's finals), but I've been too lazy to wear any kind of foundation product this month. It just seemed like so much effort to put it on and use a brush to blend it out. I don't have time for that! Instead, what I've been doing is I have been combining a little bit of a foundation that are too dark for my skin tone (or just fuller coverage that I prefer) with my daily moisturizer. It's also been a great way to use up products that were too dark for me before! Right now I'm mixing OLAY Complete All Day Moisturizer with SPF 15 ($8 for 4oz) and SUPERGOOP! CC Cream SPF 35 in Light to Medium ($32 for 1.6oz). I really like the result. The best part? I get sheer coverage but don't have to blend it in with a brush or set it with powder. It's almost so easy and fast that I can't not do it. I've been a fan of Stila's Convertible Colors for awhile now (see my Spring Product Picks). However, it's been years since I tried their eyeshadow. I didn't realize what was missing from my collection until I got this! Most of my eyeshadows are neutral, but I found I was missing essential colors like Bare and Bliss. The "boring" colors are my most-used by far. I find myself using Bliss as the transition shade in the crease (to make blending other colors out easier), and Bare as a brow bone highlight for every eyeshadow look I do. It's awesome. The other night, I went to a party and used Ebony and Night Sky to create a smoky look that I really liked. It's very versatile, the eyeshadows have great pigmentation, and I think everyone should have an all-purpose neutral palette on hand, even if it's not this one (though it's a great pick). Blast from the past! I received this in an Ipsy bag two years ago and it was my favorite blush for a long time. Then, of course, my love for it got buried in the midst of trying new things, but I picked it up again this month and forgot how beautiful it is! It's a gorgeous rose color, and the shimmer in it allows me to forego cheek highlighter. There's probably a drugstore dupe for this out there somewhere, but I haven't discovered it yet. If you know of any, please let me know so I can check it out! (Excuse the old picture--mine broke in my suitcase and has been molded back together with rubbing alcohol, so it is slightly gross and I just like to pretend it didn't happen). For swatches, see my full review here. I featured Caudalie's Vinosource Sorbet in my March Favorites, and it appears I'm quickly becoming a Caudalie snob (whoops). This serum is almost like an essence, in that it softens and smooths the skin. And let me tell you: my skin feels so soft and nourished after using this, it's amazing. It's also supposed to lessen hyperpigmentation, and although I don't typically have a problem with that, I did have one of those "under-the-skin" cystic acne pimples that left a stubborn mark. I think it's been helping to fade it, but since I don't have a lot of experience with them, I can't tell what is the serum's work and what is just the factor of time. I got this sample in a swap with a friend, but I don't know if I could afford to continue using this. I'm almost done with it, and it's only been about a month, so I might see if anyone else if selling it or looking to trade on a Pinterest board somewhere. No matter how happy it makes me, there's no way I can justify spending that amount of money on skincare right now (or maybe ever). I actually just wrote a full review on these! I received these from Influenster to try out, and I wasn't sure if I would like them or not, but they've quickly become a staple in my morning routine. They're good at taking makeup off, but my favorite way to use them is when I'm getting ready for the day to freshen up. I don't just do my face, but my chest, neck, and even under my arms (because why not?). I'm definitely interested in trying more of Neutrogena's wipes after this, since I also like their original makeup remover wipes (in the blue packaging). This isn't the first time I've used this product, but it has been awhile. I got my second sample tube of this in my March Birchbox and I'm happy to see it again! Too few eye creams contain SPF, so I think it's great that Supergoop (the king of sunscreen) put this out on the market. The consistency of this reminds me of traditional sunblock, since it takes a little while to soak in and looks white until it does, but I really like it. When I don't have this on hand, I've been using my regular daytime moisturizer, but I'm highly considering purchasing a full size of this in the Birchbox shop. I'm not too picky when it comes to eye cream, but the SPF definitely makes this one stand out. For those of you who have been following me on this blog for awhile, you'll know I'm obsessed with Perlier. I've used their products since before I created this website! I received another Body Balm in my January Birchbox, and as it typically goes for me, I only just got around to pulling it out when I went home for spring break. This body balm is truly what a body butter should feel like--it has the texture of actual butter (yes, like the cow) and I've never used anything so moisturizing in my life. It's incredibly thick and dense, and works wonders on the bottom of my feet, elbows, and other rough patches. If you need something heavy duty, try using this. A little goes a long way, so it'll last a long time! I got a nine-pack of Perlier hand cream from my mother for Christmas (she enables me and I love it) so thankfully I have a way to get my Perlier fix for awhile. I'll admit: I'm not much of a TV person. I very rarely get obsessed with shows, but when I do, I go hard. I've actually been living under a rock for the past seven years, so when I had some free time after spring break, I decided to pick up a show that I heard a lot about after its season finale: Parks and Rec. And let me tell you something--I have never flown through a show so fast. In less than two months, I am on season five of a show. That's completely unheard of for me. I feel like a regular college kid now. Also, no show makes me cackle as loudly as this. I love all of the characters and I'm really sad that Netflix only has one more season for me to watch after this. If you love Parks and Rec as much as I do, please let me know so we can chat about it. I need more people to talk about it with! I've loved "All About That Bass" since it came out, but I just heard "Lips Are Moving" this month and I can't get over how catchy her songs are! My roommate heard me listening to it in the shower and recommended a few more of here songs, and now I'm obsessed. I also especially like "Credit" and "Dear Future Husband." If you need an upbeat tune to dance to in the morning while getting ready, hers will put you in a good mood for sure. So here's my problem: I like to stay up to date on current events but hate reading or watching the news. I don't like having to dig through all of the boring stuff to get to the core of the issue. Well, thankfully, there's something out there that does the digging for you! This month I discovered Skimm: a free email newsletter than sends out a short roundup of just a few important things going on in the world right now. You get a short email every Monday-Friday talking about politics, the economy, entertainment, sports, global issues, and more. You know, things that you should be up to date on that are important issues, but you might not care too much about. It makes you sound smart and responsible, and they're good conversation starters. Skimm breaks it down for you really simply with a conversational tone. When I first wake up in the morning, I like to stay in bed for a few minutes and go on my phone. I used to just check Facebook and other social media, but now I start by reading Skimm. I really like it! I've always been someone that enjoys writing (both fiction and non-fiction) and I go through phases of writing in a diary. In mid-March, I started writing my journal again, but I've done things a little bit differently. I've become someone who writes in a journal every night before bed, which usually just isn't me, but I really like it. I write down every little thing that's on my mind, so that by the time I get into bed, I don't have any thoughts running through my head preventing me from falling asleep. I usually start with my "Daily Grievances," which is anything bothering me, and then I go into listing my "Daily Gratitudes" to counteract the bad stuff I talked about previously. Sometimes I write one page, other times I write up to five, but it's a great way for me to get everything off my chest and feel #blessed. What's the best thing you tried in April? Want to see more of my favorite products? Click here! Disclaimer: Not sponsored. All products purchased by me, except for the Neutrogena wipes that I received complimentary from Influenster for testing purposes. A few links are Amazon Affiliate links, but no one ever clicks those so it really doesn't matter. The Skimm referral link does nothing for me because a service can't get freer than free, so I don't understand why I have one but whatever!